esrp’s Lease Administration team understands the value of a well negotiated lease. We view our role as an outsourced partner as one in which our lease administration professionals work tirelessly to ensure your lease agreements are adhered to by the landlord. 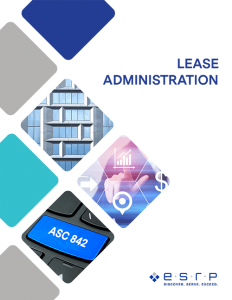 Our team members have performed lease administration for clients in the following product types: Retail, Industrial, Office, Restaurant, and Healthcare. Our team has utilized six different database solutions to provide our world class solutions. When esrp centralizes your lease information, you will have complete confidence in the accuracy of data to strategically run your business. Discovery – $204,000 Savings: A landlord misinterpreted the base year language and overbilled the tenant by $204,000. We worked with in-house counsel and landlord to correct the error. The landlord ultimately adjusted the reconciliation by the entire $204,000. Discovery – $50,200 Savings: While processing payments, we realized that the base year and reduced rent per a lease amendment were not being followed. When set in motion, our reconciliations resulted in a $50,200 savings. Discovery – $15,000 Savings: A landlord neglected to apply a lease specified 5% cap on a client’s CAM billing. We discovered and recovered a $15,000 overbilling while performing a routine desktop audit. Redundancy of Resources – No longer worry about making the wrong hiring decisions or replacing personnel when they go on vacation, leave of absence or leave employment with your company. esrp personnel dedicated to the lease administration function will be vetted by our experienced management team. We provide a back-up lease administrator for each account, so you will always have a contact within our organization. Landlord Billing Errors – Reduce the risk of overpaying landlords by allowing lease administration experts to audit the landlord charges and annual reconciliations. Ability to run straight-line rent calculations and journal entries from central source. As new FASB rules become effective, our database solutions will provide the right-of- use asset and liability opening balance sheet entries as well as the amortization schedules and journal entries. Under our leadership’s guidance, clients have saved over $50 million from landlord overbillings. We have assisted over 80 companies with six sigma quality data which can be utilized for making strategic operational decisions. Accounting departments have benefited by receiving calculations for straight line rents, as well as the journal entries and amortization schedules which allows them to operate more efficiently.